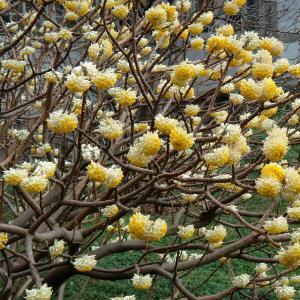 Edgeworthia. 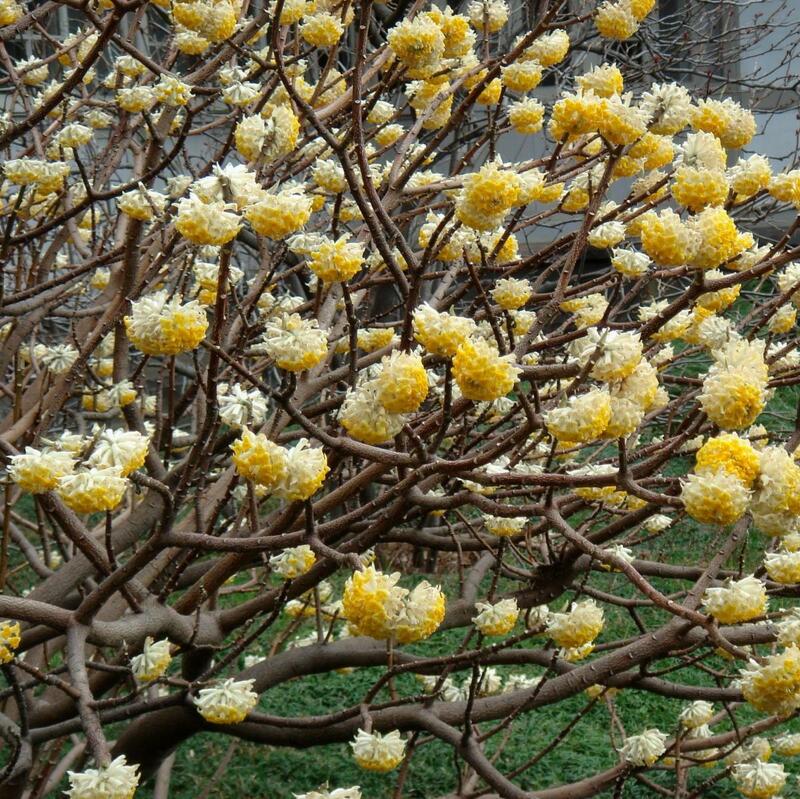 chrysantha is a small to medium-sized deciduous shrub, up to 5ft by 5ft, with papery, cinnamon coloured bark - one of the plant's synonyms, Edgeworthia papyrifera, celebrates the use of this species in the manufacture of high-quality paper used for Japanese banknotes. It has very flexible young stems that can be tied in knots. Its crowning glory is the clusters of fragrant, tubular Daphne like yellow flowers, borne in spherical heads 1.5in to 2in across from silky white buds which shimmer in the winter sunshine, before revealing the canary yellow blooms. The richly perfumed flowers of the Paper Bush decorate the tips of the bare stems from February to April in a magnificent display. Although hardy to -5C (23F), this deciduous, spreading shrub benefits from a sheltered position to prevent frost damage to the flowers. 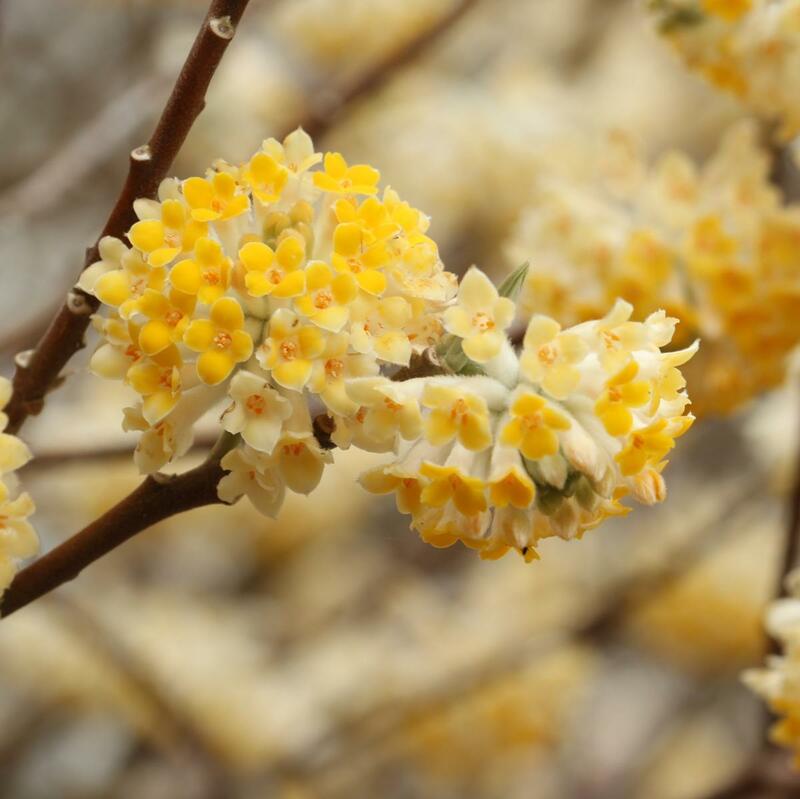 Heavily fragrant flowers are a common adaptation of plants that need to entice the few pollinating insects around in the colder months and Edgeworthia does not disappoint either insect or gardener. Preferring full sun or lightly dappled shade, a moist but well-drained humus-rich, loamy soil - the Holy Grail of garden soils - is what Edgeworthia chrysantha needs. It also needs a fairly sheltered spot. If these requirements are met it can be grown in gardens where winter frosts are common.A south- or west-facing wall will also suit, if watered regularly during hotter spells. Edgeworthia chrysantha is the only commonly cultivated plant from a tiny genus of just three species, related to Daphnes.The generic name commemorates Michael Pakenham Edgeworth, one of those redoubtable Victorian amateur botanists who combined colonial service with a passion for plant hunting. 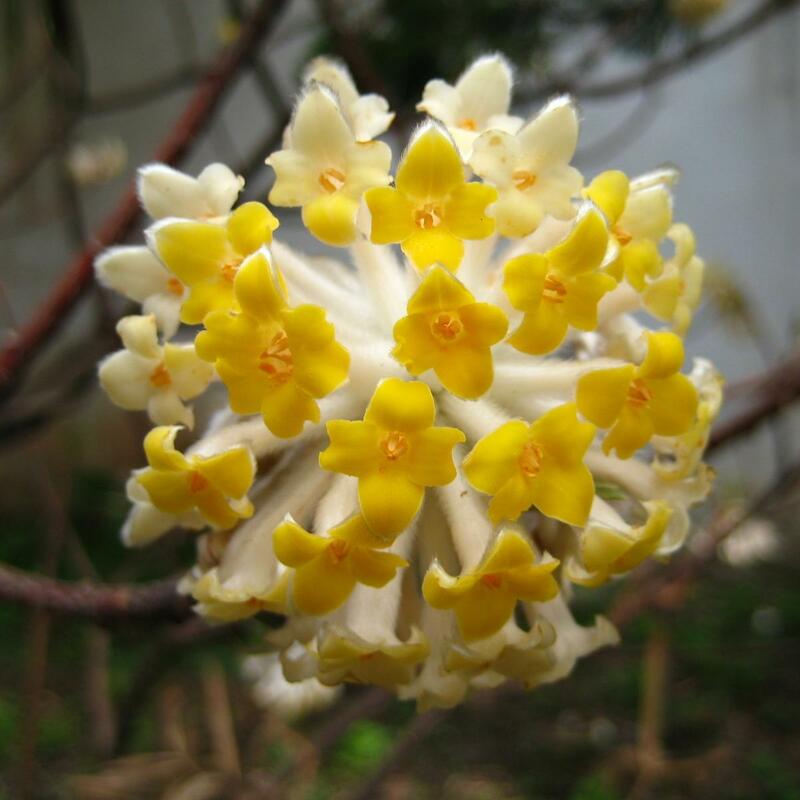 He collected Edgeworthia chrysantha in the Himalayas while in the service of the East India Company and it was introduced to British gardeners in the mid-1800s.